Almost thirty years ago, on December 7, 1979, Paramount released the long awaited Star Trek: The Motion Picture. One of the last films Robert Wise would direct, it followed the reunion of the intrepid crew of TV's starship Enterprise as they head out to confront an enormous cloud of energy threatening Earth. Once referred to as "The Motionless Picture" in Harlan Ellison's 1980 movie review for Starlog, the film was definitely a sober, more restrained version of the kaleidoscopic-paletted science fiction adventure series it was based on. But the story behind the making of the movie is full of the kind of gossip and intrigue that is the stuff of Hollywood legend. 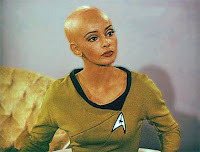 Even while the series was on the air in the late sixties, there were rumors of Star Trek making the leap to the big screen, a concept that was nearly unheard of at the time. Then in the mid-seventies, as Gene Roddenberry's 79 episode series grew a cult following in syndicated reruns, Paramount started looking into relaunching the series as part of Barry Diller's plan to launch the Paramount Television Service, a fourth TV network that would compete with ABC, CBS and NBC. 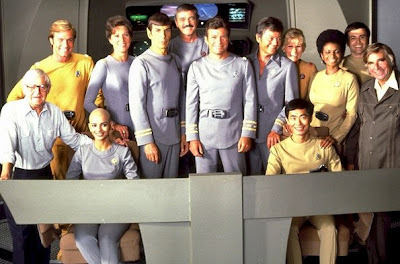 Star Trek: Phase Two, as it would be called, would unite all but one of the original cast (Leonard Nimoy being the sole holdout) with three younger crewmen, First Officer Willard Decker (Stephen Collins); his former lover, the empathic Ilia (Persis Khambatta); and science officer Xon (David Gautreaux), a young Vulcan replacement for Nimoy's Spock who would embrace emotions in order to better understand the humans he served with (if you're a Trekkie, you'll notice these characters were the models for Star Trek: The Next Generation's Riker, Troi and Data, respectively). If any other cast members decided to leave the show, this secondary cast would be waiting in the wings to replace them. With the success of George Lucas' Star Wars in 1977, and Paramount's decision to abandon the idea of a fourth network, the studio shifted gears, revising (or in some cases, even going back to the drawing board) sets, costumes, and storylines to transform their proposed series into a major motion picture. Diller would leave Paramount and go on to accomplish his dream of a fourth network when he helped launch the Fox Network in 1986. Meanwhile, Paramount sought to attract some major writers and directors to the project, with names such as Chris Bryant & Allan Scott (Don't Look Now), Philip Kaufman (The Unbearable Lightness of Being), Francis Ford Coppola (The Godfather), and Steven Spielberg (Schindler's List) all given some consideration, and in some cases, actually having a direct hand in contributing to the early development of the film. Enter Robert Wise, very late in the game. It's not that Wise hadn't directed a science fiction movie before. In fact, he had directed two classics of the genre: The Day the Earth Stood Still (1951) and The Andromeda Strain (1971). But the poor man walked into quite a mess. A major chunk of money had already been spent on the development of the sequel show with much of the output now to be ignored. These costs were folded into the production costs of the movie, money which would now be working against the film on its balance sheet despite none of it applying to the film proper. Some of it had to do with Wise's justified predilection for reality. He didn't want the rainbow-colored series backdrop to distract from an ambitious story, so he insisted on muted colors for the sets and costumes. He was aware of Nimoy's integral role in the series' success, so he lured the actor back by giving him more input and more money. And Wise was unaware that a clause in lead actors William Shatner and Nimoy's contracts gave them story approval if the film were to go past a certain date in its production period, which it already had. This slowed the wheels of progress even further. The two actors were now calling for almost daily changes in the script throughout the production. Paramount also decided to hire the best of the best in special effects artists to make sure the film's verisimilitude was not compromised in this post-2001, post-Star Wars era of science fiction films. They brought in the expensive and legendary Douglas Trumbull (2001: A Space Odyssey) and John Dykstra (Star Wars) in March of 1979 to complete the effects by the film's December release date. Money was no object in Paramount's eyes, as they were banking on this pre-sold property to duplicate or surpass Star Wars' success. Finally, the film's premise was nailed down. Kirk, Spock, and the rest of the crew would face the menace they would come to call V'Ger. A parallel storyline would have the half-human, half-Vulcan Spock find the answers to his own struggle with emotional suppression, a Vulcan trait, by gazing deep into the cold abyss that was V'Ger. The Enterprise crew would discover that the machine-like V'Ger was a lost NASA Voyager probe that had merged with an alien intelligence, and gone back to Earth to find its creator, unaware that it was humans who originally built it. Decker and Ilia would be lost during the mission. But the newly reunited Enterprise crew would embark on a new mission of exploration, and a new film franchise. As a fellow enthusiast once explained it to me, the movie was a seventies-era, realistic take on the classic Trek trope of man poking a hole in the notion of an all-powerful God. He promoted the idea that the film's performances are subtle, as if Redford and Newman were starring rather than Shatner, et al. With some spontaneous touches, like Kirk's wink at Chekov (Walter Koenig) as the ship gets underway on its mission, or Spock's small smile to Kirk after surviving his recent near-death, I can see what he's saying. While I consider my friend's declaration to be a bit hyperbolic, it is safe to say that Wise contributes a certain sense of maturity that has gone unappreciated in this much maligned movie. For fans of the series, the rewards lie in seeing the actors together again. Shatner, Nimoy, and DeForest Kelley, who played the central troika around which the show revolved, here approach each other with the tentativeness of longtime friends still feeling their way around a years-long separation. Shatner is less hammy than he's ever been. His Kirk can best be summed up by the word "pushy," cajoling any one in his way to retake the center seat in the Enterprise, after two years as a paper-pushing bureaucrat. But it is Nimoy's role of Spock that grows the most, finally coming to peace with his emotions, a fundamental change to the character that eluded him throughout the series, but informed his remaining performances as the Vulcan, all the way up to and including Spock's appearance in J.J. Abrams' Star Trek (2009). The story's ambitions are closer to Kubrick's philosophical leanings in 2001, than the adventures of Lucas' Star Wars. Instead of choosing to fight the threatening alien, the brave crew goes out of its way to seek to understand the foe they face. And its realistic special effects go a long way towards establishing the association with 2001. The ships never zoom along like the fighter ships of Star Wars, despite being equipped with similar weapons. But Star Trek: The Motion Picture never goes full bore for either side. Neither fish nor fowl, the movie can sometimes prove to be a slog for non-Trekkies. The aforementioned special effects scenes can be ponderous and tedious (influencing the title for Ellison's pan of the picture). Supposedly the shots were left long at Paramount's insistence, who sought to see every penny they spent on the film up on the screen. After a lot of hand-wringing and false starts, Wise rushed the movie out for release, in what he has long since admitted was a rough cut form, without testing it in front of an audience. In fact, he carried the fresh print of the movie himself to its Washington, D.C. premiere. Though the film had the most successful opening of ANY film up to that time, its long-term run ultimately didn't meet Paramount's expectations. The studio would cut the budget by a third for their second attempt, the far more successful Star Trek II: The Wrath of Khan (1982). Roddenberry would be sidelined, given only a consultant credit in subsequent films before redeeming himself with the creation of TV's Star Trek: The Next Generation in 1987. Despite all of this, when taking inflation into account, Star Trek: The Motion Picture was the biggest grossing of all the films until this year's sequel unseated it. And Robert Wise? I think this bad experience may have broken him in a way. He would return to direct only two more mediocre films. But just before his death, he got a chance to correct some of the mistakes he perceived he made, releasing a Director's Cut of the film on DVD. Here he got to clarify some of the story with new CGI effects, enhance some of the shipboard ambient sound, and tighten up some of the film's lengthier scenes. It is only available on DVD as of the moment, but you can compare it to the original theatrical version just released in a stunning new Blu-ray edition. Robert Wise died in 2005 at the age of 91. Very informative essay, I had known very little about the trouble surrounding Star Trek's production, and to have it illuminated so concisely is a real treat for me. I don't consider the original Star Trek movie to be as dull and trite as most of the critical community, but I'm not a Trekkie and I'm sure it certainly isn't what would've been expected at the time. I didn't know much about the making of this film, but I did see it several years ago and found it less boring than I expected it to be. Until your review, though, I didn't know there was a director's cut with Wise's involvement, and that is something I definitely have to see.